"the very best Condo in El Faro"
Size: 320 sq. m. "160m2 terrace inculded"
One of our bestsellers in Playa del Carmen in the apartment category! Regarding vacation rental, the guests give this quality / price ratio a rating of 8.. This property is on the beach. El Faro Residences is an exclusive complex with 65 luxury suites located in the heart of Playa del Carmen, only one block away from the famous 5th Avenue and the main night clubs, restaurants and bars from the area. El Faro residence has a private beach area, infinity pool, sun terrace and free Wi-Fi throughout. The apartment offer contemporary decor, flat-screen cable TV, DVD player and iPod dock. The kitchens come with dining area, stove, kitchenware, fridge and microwave; While the bathrooms include shower. This beautiful penthouse is 2 km from Xcaret and from Playa del Carmen Main Square. 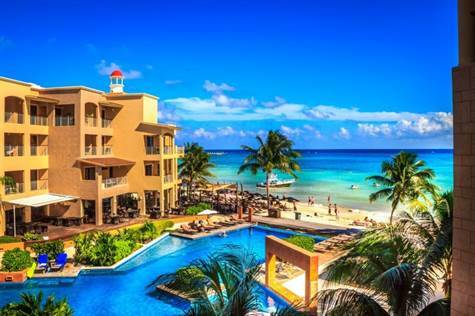 Cancun International Airport is a 1-hour drive away. This is the preferred area for travelers visiting Playa del Carmen, according to independent guest reviews. El Faro Residence has also been well rated for its excellent location in Playa del Carmen! Customers are more satisfied in comparison with other establishments in this city. The very best Condo in El Faro and Playa Del Carmen is being offered for first time for sell by owner. Enjoy three bedroom and three bath with two master suite penthouse on fourth floor with total 160 Sq M and 160 Sq M balcony over looking beautiful Caribbean Sea, 180 degree view of ocean. This is the only Condo in entire Playa Del Carmen that has NO joining wall with any other units. Soak in amazing Jacuzzi and relax with glass of margarita.